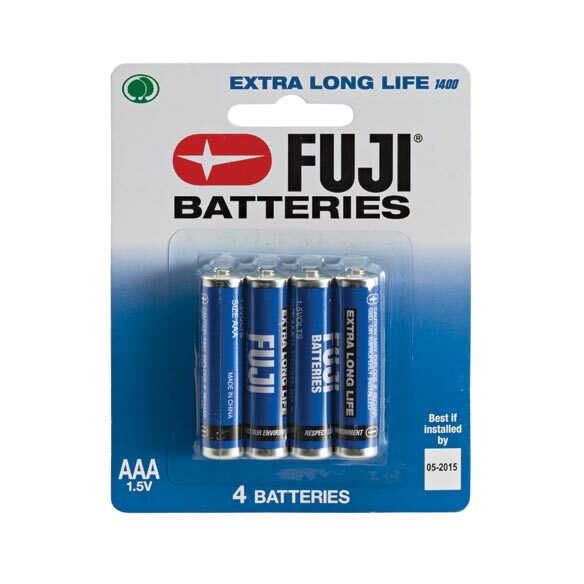 Stock up and save on long-life Fuji batteries. Free of mercury and cadmium, they’re ideal for all your battery-powered electronics: remotes, clocks, flashlights, radios and more. I only buy Fuji batteries! I have small things like small flashlights, clocks,decorations,etc., that use these sized batteries, so I knew I couldn't go wrong taking advantage of this deal. EVERYONE NEEDS THESE TRIPLE AAA'S FOR ALL OF THEIR SMALL APPS LIKE CLOCKS, ETC. I LIKE TO KEEP A SUPPLY ONHAND AND THE PRICE WAS CERTAINLY RIGHT. Will use for a presentation. So far, I like the results. Strong, bright light used in "hug li?ht". Couldn't ask for more. Always used other brand batteries, but am impressed with Fuji battery. So far, no complaints. This product was ready for immediate use and easily inserted into the clock for which they were intended. Very handy to have them available when you need them. Average price. It goes with the magnifier. To use for Hug Light. for charging the Hugs light. Needed batteries for several purchases. Because I could use this for my light And I could use the neck light to read with at night. Because the BP wrist monitor I ordered needed batteries. Because of my confidence in Easy Comforts products and return policies, I am comfortable purchasing from them. Good value for quality batteries.